PT Bank Mandiri (Persero) Tbk - Bank Mandiri is a leading a state-controlled banking company in Indonesia. Bank Mandiri is a public-listed bank and its shares were listed on the Indonesia Stock Exchange (IDX) under reference code BMRI. Currently, the majority of Bank Mandiri’s shares are owned by the Government of Indonesia (60%) and the remaining is held by investors and public (40%). Bank Mandiri has its business activities focused in five sectors: Consumer Banking, SME and Micro Banking, Commercial Banking, Corporate Banking, Teasury and Financial Institution. Bank Mandiri is based in Jakarta and has 12 regional offices, 8 overseas representative offices, 2,457 domestic branch offices, 1,082 sub branch offices and 273 cash offices as of December 2015. PT Bank Mandiri (Persero) Tbk is recognized as the largest banks in Indonesia in term of total assets. According to PT Bank Mandiri (Persero) Tbk Annual Report 2015 as cited by JobsCDC.com, Bank Mandiri reported total assets of Rp 910,063.40 billion in 2015. This figures reflected as 6.43% growth as compared with Rp 855,039.67 billion in 2014. Have a GPA score min 2.75 (scale 4.00). Maximum age of 24 years old on initial selection. Strong communication (speak with respect), well dressed, well mannered and self confident. Not have nuclear family (parents, husband / wife, siblings or children) who works in Bank Mandiri. Age 18 to 25 years old and have graduated from the College of maximum 1 year. Have a good health and not color blind as evidenced by a medical certificate. Never involved in drugs or other violations of law, as evidenced by SKCK. Not married and willing not to get married during Kriya Mandiri Program. Got a recommendation from Universities (for a student). JobsCDC.com now available on android device. Download now on Google Play here. Please be aware of recruitment fraud. The entire stage of this selection process is free of charge. 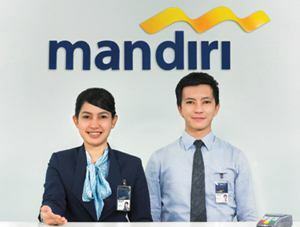 PT Bank Mandiri (Persero) Tbk - D3, S1 Fresh Graduate PKWT Staff, Kriya Mandiri July 2016 will never ask for fees or upfront payments for any purposes during the recruitment process such as transportation and accommodation.